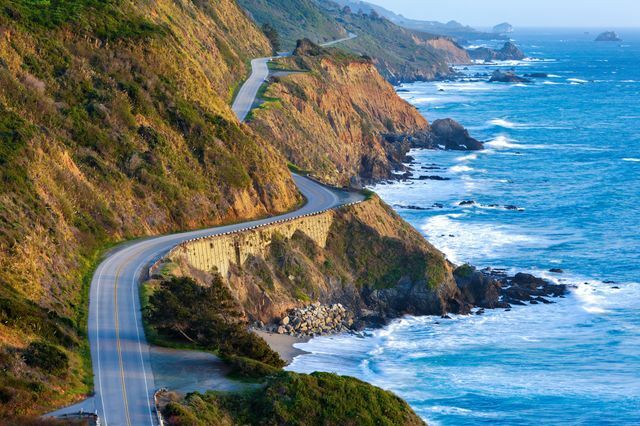 Couples looking for a U.S. honeymoon destination that's full of glorious nature will certainly enjoy a trip to Big Sur, California. For nature-loving newlyweds who want to celebrate their new marriage with a journey through some of Mother Nature’s most beautiful creations, a Big Sur honeymoon checks all of the boxes. Especially since many years of construction on highway one have come to an end, lovers who choose to head west will be fascinated by the creations of the earth as they drive through California’s central coast. Sandwiched between San Simeon and Carmel, with the Santa Lucia Mountains on one side and the Pacific Ocean on the other, this romantic excursion is meant to be experience by car and by foot. As you make your way through various towns, tour through countless beaches and gasp in awe of the jagged cliff sides and winding roads, you’ll fall in love with the planet and of course, with one another. Here, a guide to planning your Big Sur honeymoon to perfection. Here’s the deal: nicknamed the Golden State, California is known for endless sunshine. Big Sur is no exception to this rule, and while you’ll enjoy ideal, comfortable weather most days of the year, the best time to visit is from September to November. This keeps you away from the crowded season—April to October—since temperatures start to drop just a bit. So why winter? You can expect a bit of rain, which shys away some travelers and you’ll find more affordable prices. You can also try for early spring, when everything starts to bloom, making for killer Instagram photos. Rent a convertible, fill up the tank, grab some snacks, as well as a scarf for your hair and get going. You have plenty of wonders to witness for your Big Sur honeymoon. Here, just a few. Visit McWay Falls at Julia Pfeiffer Burns: Sure, you probably shouldn’t spend your life chasing waterfalls, but this one isn’t tough to spot. Only a quick walk from the main parking lot, this magnificent water creation is not to be missed. (And hey, you just got married, so feel free to steal a smooch!). Afterward, you can venture through seven marked trails and if you’d like, even go scuba diving, since it’s the only place in Big Sur where it’s permitted. Wander through Andrew Molera Park: Set on 4,800 acres, there’s plenty to experience at the largest state park of Big Sur. You can hike through their trails, venture through redwood groves and meadows, and even take a dip in the river. If you’re a surfer, this is also a happy spot to hang 10. Walk along Sand Dollar Beach: For the days when you don’t quite feel like hiking during your Big Sur honeymoon, park the car and lounge by the Pacific at Sand Dollar Beach. You can see for miles and trust us, you won’t want to miss the captivating sunset from the sand. Go hiking at Garrapata: If you want to hike the legendary St. Lucia mountain range, here’s where to do it. Because it’s located between the coastline, you’ll see valleys full of lilies, ocean views and much more. With various terrains, it’s not for the faint of heart, but ideal for experienced outdoor-loving couples. Drive the 17-Mile: This scenic route is dotted along the coast line and has plenty of things to see, eat and do! Don’t miss golf courses (if that’s your thing), or stop for all of the picture opportunities and noshes. See Bixby Creek Bridge: When you imagine Big Sur, you likely think of this construction that ties together two gorgeous stretches of land. This arch bridge is beautiful from afar… and a little tummy twirling to drive across. Tour through Point Lobos: Featuring two marine-protected areas, this Big Sur spot is often referred to as the ‘crown jewel’ of the 280 parks in California. When you first catch a glimpse of it in person, you’ll understand why. Take a tour through San Carlos Borromeo del Rio Carmelo: Since you’ll spend most of your time trekking mountains or taking curves with care during your Big Sur honeymoon, a few hours to stretch your legs and learn about history is recommended. This church was originally built in 1797, and has been restored over time. Go shopping on Ocean Avenue: With lots of local artisan shops, cute cafes and bars, you should spend a few nights in this bed-and-breakfast heavy region, to ahem, celebrate your marriage in a behind-closed door way. Hike to the Point Sur Lightstation: About 135 miles south of San Francisco, this 1889 lighthouse is part of the Point Sur State Historic Park and makes for a great landmark to walk towards. And of course, to snap a photo in front of!